« Baking soda…or covert cocaine operation? I am not a big beverage drinker in general since I kicked my addiction to orange juice. My husband and I were going through the family size jug at least once a week. It was delicious and thirst quenching but dangerous for the pancreas since it was such a concentrated sugar rush without the fiber and being processed. My doctor at the time encouraged me to stick to water and teas and if I wanted to juice, to just eat the fruit. It was easy to make the transition and I don’t have juice cravings anymore and am eating more fruit. My diet has drastically changed since being in Peru for 3 months. Luckily, it’s not as bad as I was worried it would be in a meat-importing country. We have been able to find beans, occasional quinoa and some green vegetables (but not really in restaurants). The fruit options here are amazing and the concept of juice is quite different than in the US. I’ve been drinking juice here again, but it is different than the OJ box binges. Here, juice usually doesn’t come from the supermarket, it comes from your blender. While people may not have ovens or freezers, the one indispensible kitchen item I have noticed in this country is a strong blender. I have seen people use blenders for making purees, sauces and even grinding entire batches of peppercorns. If you order juice in a restaurant or even on the street, the fruit is pureed whole in the blender with water and a little unbleached sugar (and sometimes strained). It’s a nice in between world of boxed juice and the natural fruit itself. In addition to the blender juices there’s a variety of other drinks available, from fresh-squeezed orange juice, to home-made soymilk, to my current favorite, chicha morada. 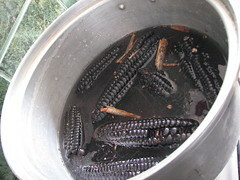 Chicha morada is considered a juice and it consists of boiled corn water, to put it bluntly. 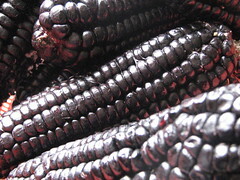 The purple corn here is inedible to my tastebuds and I have only seen it served as a delicious, rich-tasting drink. There are a lot of recipes to make chicha morada but the majority of them contain cinnamon, lime juice and sugar (and pineapple skins). 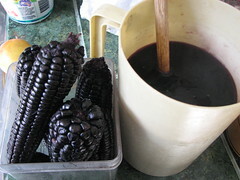 Chicha morada is different among each person that makes it. Some of them taste like prune juice and some like a version of Kool-Aid. Most people sell it on the street but there are a few companies that mass produce it and sell it like Coke. My favorite recipe comes from a girl I met in Huanchaco, and she serves it cold in a big wine goblet. 1. Place the corn, cinnamon, cloves in a small stockpot and cover with cold water to cover the corn by at least an inch of water. It is better to start with less water and add more to your taste. 2. Bring the water to a boil and boil, uncovered for 10 minutes. 4. 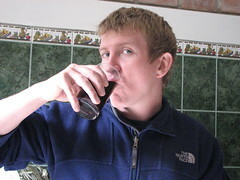 Add sugar to taste and keep in mind that the sugar will not be as strong when it it cold. 5. Add lime juice to your taste. I use about 2 limes and a little more before serving. 6. Add ice cubes if you can’t wait or cool and drink within 5 days. Chicha morada is not to be confused with chicha de jora, which is the spit-fermented local brew (tastes like an apple cider vinegar mixed with kombucha). Chicha morada is NOT fermented and is high in antioxidants and helps digestion, control weight, blood pressure and cholesterol. It does have too much sugar for me to drink all the time, but it’s a tasty drink alternative here if you want to avoid all the sugary sodas here, like Inka Kola, which is neon-yellow and tastes like Bubble Yum Bubble Gum. thanks a lot, it is exactly what i was looking for! Can you make a chicha morada without sugar ? What’s the price per bottle ? i think it would be gross without sugar…it’s just purple corn so it would be sort of bitter. can you do agave?